Pam Gilbert, of Sidney, a volunteer who participates in Ohio Living - Dorothy Love’s line dancing, models a rain coat at Ohio Living Dorothy Love’s Spring Tea Tuesday, April 9. All clothing modeled came from the Twice Around Shop at Ohio Living - Dorothy Love. 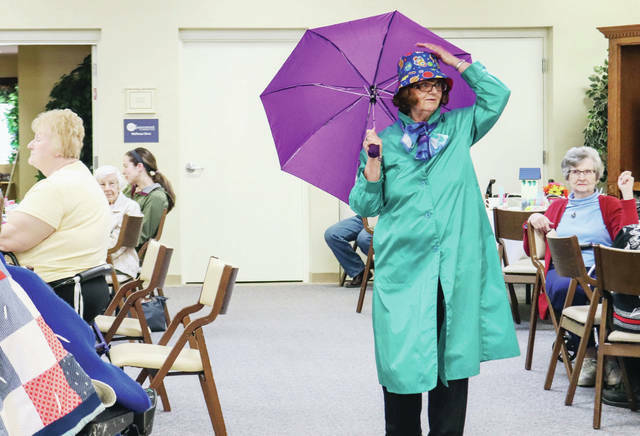 Pam Gilbert, of Sidney, a volunteer who participates in Ohio Living – Dorothy Love’s line dancing, models a rain coat at Ohio Living Dorothy Love’s Spring Tea Tuesday, April 9. All clothing modeled came from the Twice Around Shop at Ohio Living – Dorothy Love.